Ramble On, Rose... 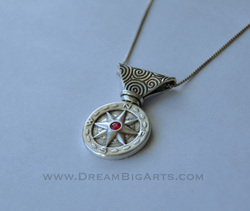 This is a spectacular piece, handcrafted in fine silver with a single ruby at the heart of the compass rose. A reminder to follow your inner compass, your dreams, travel where you may and find adventure whenever you can! This piece is custom made to order, please allow 2 weeks. You may specify a different stone color if you wish!